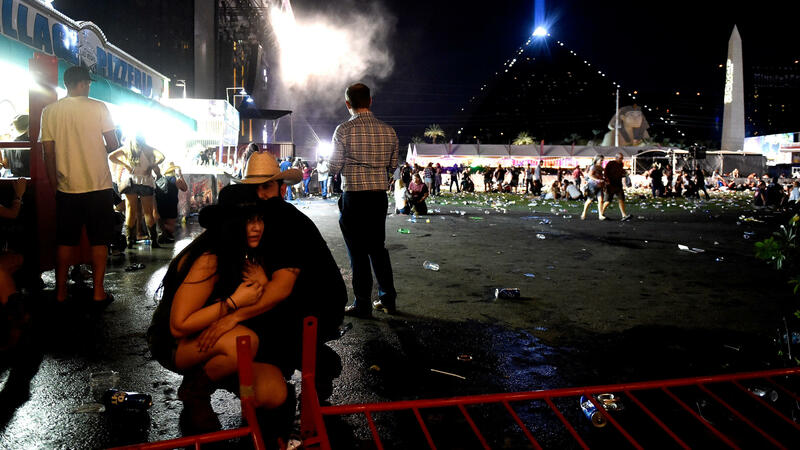 People take cover at the Route 91 Harvest festival after a gunman opened fire on the festival from a room in the Mandalay Bay Resort and Casino in Las Vegas. Police officers take cover near the scene of a shooting near the Mandalay Bay Resort and Casino on the Las Vegas Strip on Sunday. Medical workers set up a staging area near the Route 91 Harvest festival concert on the Las Vegas Strip on Sunday. Gunfire was reported around 10:08 p.m. local time, Clark County Sheriff Joe Lombardo said at a news briefing. People wait in a medical staging area on Monday, after a mass shooting during a music festival Sunday on the Las Vegas Strip. Police say Stephen Paddock fired down at the crowd of more than 22,000 people from his room on the 32nd floor of the Mandalay Bay Resort and Casino. 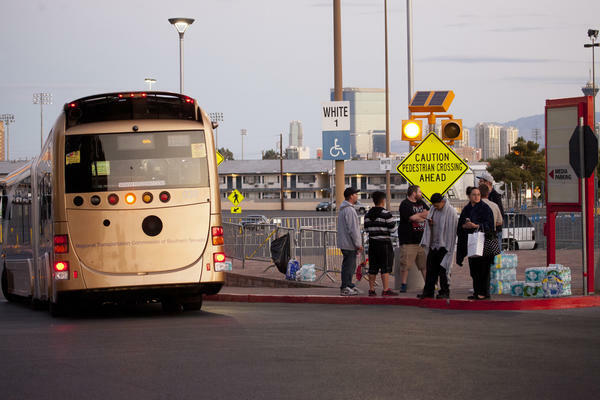 People wait for a ride outside the Thomas & Mack Center on the campus of the University of Nevada, Las Vegas. The facility served as a refuge early Monday morning, following a mass shooting at the Route 91 country music festival along the Las Vegas Strip. A gunman holed up in a hotel room high above the Las Vegas Strip fired down upon thousands of people attending a music festival Sunday night, in a brutal attack blamed for at least 59 deaths, a law enforcement official says. In the mass shooting and panic that ensued, 527 people were injured. At least one of the dead is an off-duty police officer who was attending the concert. The suspect is also dead. Police say they're still trying to learn what could have motivated such an attack. The sound of gunfire at the Route 91 Harvest festival concert was reported around 10:08 p.m. local time Sunday, Clark County Sheriff Joe Lombardo said at a news briefing. He identified the shooter as Stephen Paddock — a 64-year-old white male who is a resident of Nevada — and said the suspect was acting as a "lone wolf." Responding to reports by the ISIS-associated news agency Amaq that the terrorist group had claimed responsibility for the attack — and that Paddock had converted to Islam — FBI Las Vegas Special Agent in Charge Aaron Rouse said on Monday that the agency has "determined, to this point, no connection with an international terrorist group." Paddock fired down at the crowd of more than 22,000 people from his room on the 32nd floor of the Mandalay Bay Resort and Casino, according to the Las Vegas police department. A SWAT team used an explosive to breach the room, Lombardo said, and when police entered, they "found the suspect dead." Police say they believe Paddock killed himself. Lombardo said "in excess of 10 rifles" were found in the room; he did not identify the guns other than to call them rifles. He later added that information suggests the suspect had been in the hotel room since Thursday. The violence is now being called the deadliest mass shooting in modern U.S. history, and the tragic death toll seems likely to rise. Forty-nine victims were killed in the June 2016 mass shooting at the Pulse nightclub in Orlando, Fla. In an update delivered just before 9 a.m. local time, Lombardo said police at the Las Vegas Village concert venue across the street from the Mandalay Bay hotel face a "long process of body recovery out there, and evidence recovery and evidence documentation." Sheriff Lombardo shared the number of a missing persons hotline that people can call to check on their loved ones: 1-866-535-5654. Local officials also asked people to donate blood through United Blood Services — and a massive response followed, with long lines prompting the service to deploy mobile donation vehicles and open more facilities to the public. Others showed up to offer water and snacks to people waiting in line, local Fox 5 News reports. 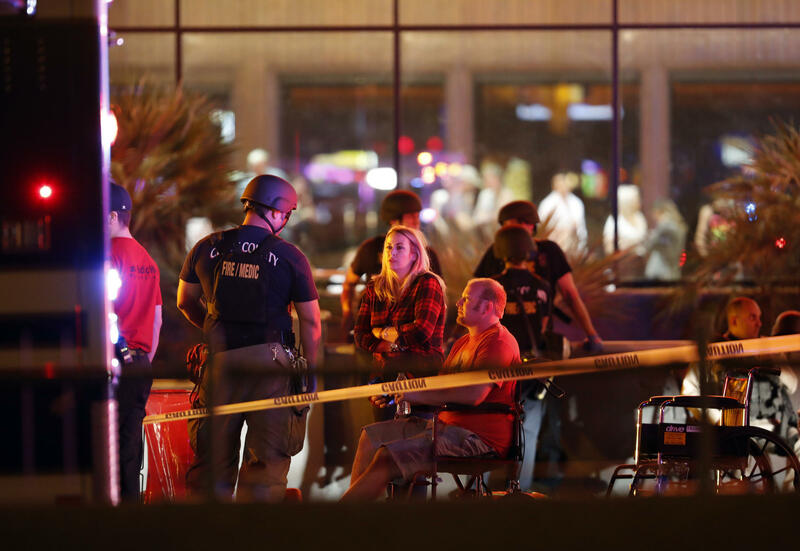 "What we ask for is blood," Las Vegas Mayor Carolyn Goodman said, recalling the offers of help that have followed the assault on residents and visitors to the tourist hub. "Please donate blood." Goodman called the gunman "a crazed lunatic" who carried out an "outrageous" attack that runs counter to her city's values. Images and video from the Las Vegas Strip are harrowing. They show masses of people screaming and trying to seek safety as torrents of gunshots echo through the concert area. Witnesses said that at first they thought the gunshots were fireworks. After the danger became clear, several said, they were still unsure where to run — because they couldn't see where the bullets were coming from. Two on-duty police officers were injured during the shooting, the department says, adding, "One is in stable condition after surgery and the other sustained minor injuries." "Obviously this is a tragic incident, and one that we've never experienced in this valley," Lombardo said. The goal now, he said, was to "get our first responders back on their feet" and conduct a full investigation. President Trump said via a tweet, "My warmest condolences and sympathies to the victims and families of the terrible Las Vegas shooting. God bless you!" Later, in a White House address delivered shortly before 11 a.m. ET, Trump said he will visit Las Vegas on Wednesday. He also said he has ordered U.S. flags to be flown at half-staff. "In moments of tragedy and horror, America comes together as one — and it always has," Trump said. Little is known about the suspected gunman. As Casey Morell of member station KNPR reports about Paddock, "He lived in a town called Mesquite — which is about 90 minutes north of Las Vegas" in Clark County. Investigators "have conducted a search warrant" at Paddock's residence, the Mesquite Police Department said. Lombardo later added items were taken from the house, and that an additional property will also be searched. Paddock seems not to have had a criminal record. "The only thing we can tell is he received a citation several years ago and that citation was handled as a matter of normal practice in the court system," Lombardo said. In the initial hours after the shooting, the Las Vegas Metropolitan Police Department said police were looking for Paddock's female companion, Marilou Danley. Early Monday, the department said, "we are confident we have located the female person of interest" — but they later clarified that they believe she was not involved. Lombardo says she was found "out of the country" and that Paddock had used some of her identification. Police have also located two vehicles associated with Paddock: a Hyundai Tucson and a Chrysler Pacifica. A Jason Aldean concert was underway at the time of the shooting. On social media, Aldean said he and his crew are safe. In an Instagram post, he called the shooting "beyond horrific." 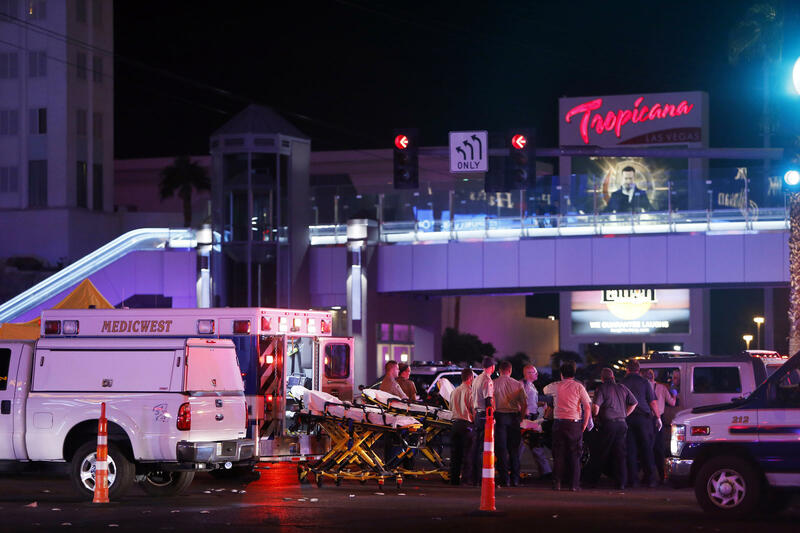 The mass shooting prompted panic and a lockdown at hotels along the Strip, as a barrage of gunfire rained down on the crowd. Musician Jake Owen, who played on the same stage as Aldean earlier Sunday night, told CBS News that the stream of gunfire seemed to go on for at least six minutes and possibly as many as 10. He took shelter behind a car with a crowd of other people, he said. "Concert-goers reported seeing muzzle flashes from the upper floors of the Mandalay Bay Hotel and Casino across Las Vegas Boulevard from the country music festival and the sound of what they described as automatic gun fire. "Witnesses said they saw multiple victims as they fled the gunfire raining down on the concert venue. "Some later huddled in the basement of the nearby Tropicana hotel-casino. 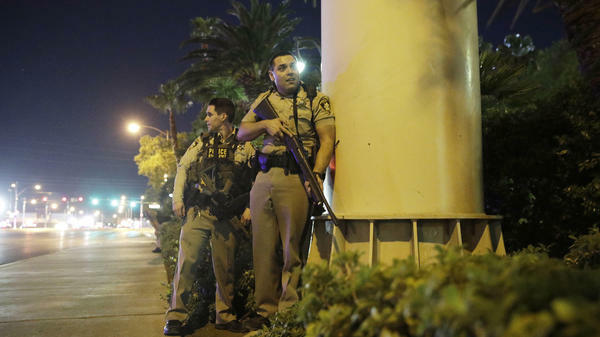 "Some officers took cover behind their vehicles while others carrying assault rifles ran into the Mandalay Bay Hotel and Casino." Tens of thousands of people attended the weekend-long Route 91 Harvest festival. Aldean was headlining the final night of the three-day concert; the festival schedule called for him to go on stage just before 10 p.m.
Flights in and out of nearby McCarran International Airport were temporarily halted, but some flights resumed early Monday. The killing of dozens of innocent people has prompted questions about how to define the horrible crime — particularly whether it could most accurately be called domestic terrorism. When asked about that distinction, Lombardo said, "We have to establish what his motivation is first. And there's motivating factors associated with terrorism other than a distraught person just intending to cause mass casualties." NPR's Leila Fadel says Las Vegas Metropolitan Police Department Undersheriff Kevin McMahill described the shooting as an act of "domestic terrorism." Paddock's brother Eric, who lives in Orlando, Fla., says the family doesn't know why Paddock might carry out a deadly shooting. "We have absolutely no idea whatsoever," Eric Paddock said to reporters gathered outside his home Monday morning. "We have no idea why he did this. And that's what you're going to find out. I can't imagine. When you guys found out why this happened, let us know. I have no idea whatsoever." Visibly distraught, Eric Paddock said the family sends its condolences to everyone affected by the attack. He said he was "dumbfounded" after being told that his brother had killed dozens of people. As for the guns Stephen Paddock reportedly used, Eric Paddock noted that his brother doesn't have a military background and asked, "Where the hell did he get automatic weapons?" Eric Paddock described the suspect as someone who gambled in Las Vegas casinos, enjoyed burritos, and dated a woman who sent cookies to their mother. The last contact between the two, he said, was when Stephen Paddock texted to check on his family after Hurricane Irma hit Florida. City and county officials have set up a GoFundMe campaign to support victims and their families, Clark County Commission Chair Steve Sisolak said. The campaign has a goal of $500,000; within three hours, it had raised nearly half that amount — with the total spiking after Sisolak mentioned it in a morning TV briefing.